I've had a suspicion from the start of this whole thing that going cycling on the west coast of Ireland in March was probably a bit of a silly thing to do, especially when I was advised not to camp due to soggy ground and gale force winds - but I'm not so easily put off doing silly things so I went and did it anyway (the cycling, not the camping). 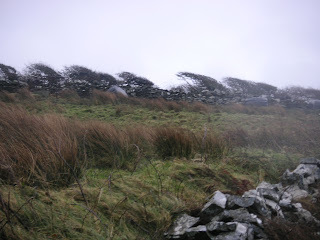 Today looked a bit rainy and miserable from the start - so I put off going out on the bike until the afternoon, when it was still a bit miserable and quite windy, but I didn't want to waste one of two days here so set off anyway, in the direction of the Cliffs of Moher. 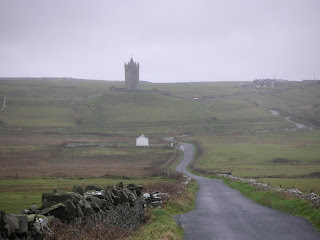 I rode out of Doolin, and the road soon started to take an upward turn. At one point it got steep enough that I had to get off and push (note: if a road is that hard to get up, it's probably pretty scary coming down) The wind picked up quite quickly as I ascended, fortunately it was behind me - if it'd been against me, I probably would have turned back. When I reached the top of the hill, there was a right turn and the nice tailwind turned into a rather scary sidewind. I could still just about keep the bike from being blown off the road, but barely. I carried on like this for a mile or two, looking out for the cliffs, until the rain started stinging my face and I realised how loudly the wind was howling, and how insane it really was to be up here, and that it was unlikely I'd see much of the cliffs anyway from the road, especially with stinging rain in my eyes... so I turned around. The trip back was just as much fun, except I had to try extra hard to control the bike so it wouldn't get blown into the oncoming traffic (not that there was much, you'd have to be insane to go out in that weather). Going down hill, the wind was straight into my face and the rain was stinging like hell, so I pulled my buff over my face and put the sunglasses on. I'm pretty well equipped for bad weather - double layered trousers with magic wicking stuff, leg warmers, heavy duty raincoat, waterproof windproof gloves, buff, awesome hat... but eye protection is still a problem. My sunglasses are OK but dark lenses aren't always a good thing, and in the cold they mist up as badly as dgym's car. So, if any of you are wondering what to get me for my birthday, here's an idea: sunglasses with interchangeable lenses and little windscreen wipers on the inside. Naturally the weather brightened up once I'd got back and changed into dry stuff.